Jaidas are cute and cuddly Haida animals that I created during my apprenticeship with Haida Artist Clarence Mills. I combined the cuddly features of Hello Kitty with traditional Haida artwork to create several characters that I will use to create a series of children’s books. Together, my Jaidas create a team of public health representatives who love to talk about medicine! “Dirty Paws” is my first children’s book that I wrote and fully illustrated in my second year of medical school for a self-directed project called DPAS (Doctor Patient and Society). “Dirty Paws” features a few of my Jaida characters, a wolf puppy, a frog and an eagle. In “Dirty Paws”, Little Jaida learns the importance of washing her paws after playing with paint and clay. The trail of paint represents the spread of bacteria and viruses, which Big Eagle explains, can make her sick. 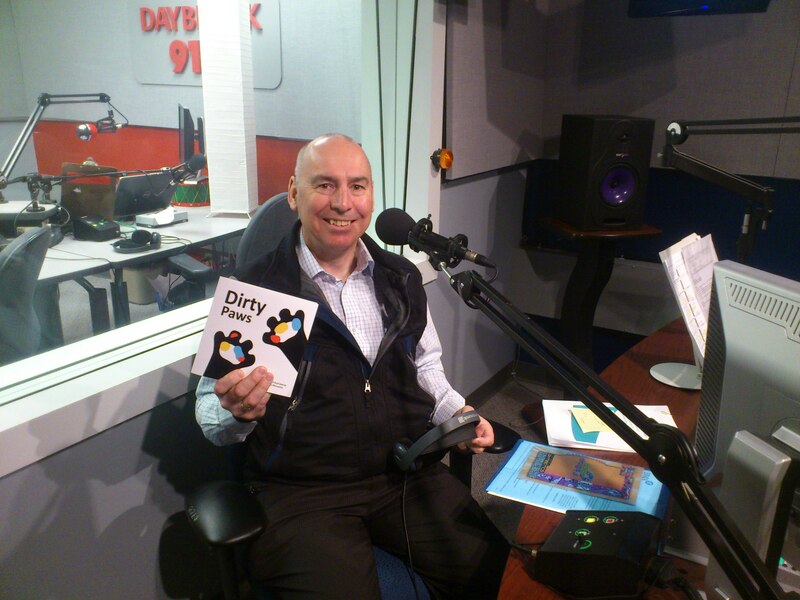 A photograph of Dr. Dinwood, Regional Associate Dean of UBC Northern Medical Program, holding a copy of “Dirty Paws” in the CBC Radio Station during an interview on Daybreak.